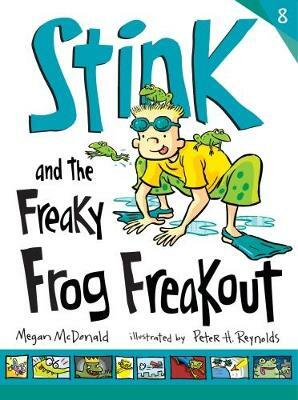 Stink is learning to swim and trying to protect the local frog population in the eighth book in the series from bestselling author/illustrator duo Megan McDonald and Peter H. Reynolds. The eighth book in the series about Judy Moody's little brother, Stink, is perfect for children who are learning to swim, and will delight of fans of Kes Gray and Judy Blume's Fudge books. Stink has been in the Polliwog swim class for ever and he still can't bear to put his face in the water. But then something weird happens: Stink starts to see frogs everywhere - in the changing room, in his boot, in the bathtub. And when a freaky blue frog licks his arm, his froggy senses start tingling! Suddenly, Stink can't wait to play in the rain and mud. He's a whiz at identifying frog calls. And he has become very interested in the local frog population. Could it be that Stink is turning into the Amazing Frog-Boy? Ideal for children learning about the environment and conservation, the graphic novel sections also make this great for comic-book fans.